Have you been living with missing teeth for some time? Are you looking for a natural way to achieve a beautiful, complete smile once again? Apple Dental can provide high-quality dental implants to patients in the Lane Cove and Chatswood area, to deliver excellent functional and aesthetic results. Dental implants are the ideal solution to replace missing teeth, as they look, function, and feel completely natural. Implants are also placed in your jawbone to improve the strength and integrity of your facial structure, ensuring your replacement teeth are in place no matter what you’re doing. Our dental implants are made of medical-grade titanium, which integrates naturally with your jawbone to form the foundation for other dental devices, such as crowns, bridges, and dentures. Implants help prevent bone deterioration, loss of facial muscle elasticity, and jaw joint problems caused by a lack of support when you bite. And of course, filling the gaps left by missing teeth with dental implants is the effective way to fix your broken smile and help restore your mouth’s full function. Before your treatment, in our comfortable practice in Lane Cove your dentist will discuss your dental implant placement, complete a detailed diagnostic phase, and develop the most suitable plan to place your implants in a precise and comfortable manner. Whether you need one or multiple dental implants, our high quality treatment helps you regain your confidence to smile and restore your mouth’s complete function for years to come. At Apple Dental Lane Cove, our dentists use computer guidance when placing dental implants, to prevent poor placement and maximise ideal implant positions. This technique ensures better safety, greater treatment success and improved final tooth positioning for you. Click here to find out more about this exciting technology. Apple Dental has invested in a cutting-edge new treatment technology that combines CEREC processes with 3D x-ray data from GALILEOS. Thanks to the GALILEOS software, implant planning is now a streamlined process, from understanding your mouth’s current situation right through to planning for the implant placement. Merging information from the 3D cone-beam x-ray imaging of your teeth and jaw and the CEREC digital model of all your teeth, we can plan your new implant and tooth replacement to precisely fit your individual circumstances. With the CEREC system we can then custom-make crowns for your implants that will fit into ideal positions for the desired final result, giving you better, more aesthetic and longer lasting implant tooth replacements. This revolutionary technology helps us to streamline your implant treatment, in most cases reducing the number of appointments needed to just two: the first to place your implant, and the second for your new CEREC-produced tooth replacement. 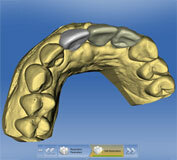 One of the greatest advantages of combing CEREC and GALILEOS is that it allows us to have implant guides custom-made in Germany by siCAT, specifically for each patient. With these guides we can place your implants with great precision, removing the possibility of errors and eliminating the need for scalpels or stitches. Instead, we can utilise a key-hole approach, with its consequent easy and rapid healing. Thanks to CEREC and GALILEOS, Apple Dental can provide you with implants that are easier to achieve and much more efficient, to give you a highly aesthetic and successful end result. Are you willing to know more about this technology? Feel free to contact us on (02) 9420 5050. Apple Dental location: 1 Finlayson St Lane Cove NSW 2066. 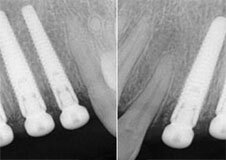 And finally, after implant placements using guides produced by siCAT in Germnany, final x-rays confirm ideal implant placements. A missing tooth or chronic tooth infection may cause a bony defect, or area where bone has dissolved, limiting your ability to receive a dental implant. In such cases, we may recommend a bone grafting procedure. Also known as bone augmentation, bone grafting aims to “build up” your bone, to allow us to successfully place your new dental implants. We can graft either your own bone from elsewhere in your body, or an artificial bone substitute to fuse with your existing bone. Performed under local anaesthetic, in your grafting procedure the bony defect is prepared, and the substitute bone is carefully placed to regenerate new bone growth. The bone graft may be covered over with a membrane barrier to protect the site, encourage the growth of new bone, and prevent the formation of fibrous scar tissue. Over time, the bony defect will be reduced as newly formed bone fills in the area. Essentially an artificial tooth root that is placed into your jawbone, dental implants are made from very strong, biocompatible titanium. After an initial healing period, during which the implant is buried in bone under your gum tissue, it is uncovered and connected to a small metal post that secures and supports a crown, fixed bridge or a full set of dentures. 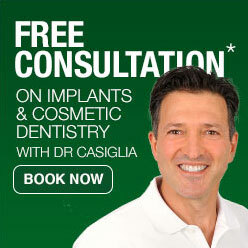 Dental implants offer you a tooth replacement that’s the closest thing to your natural teeth currently available. More secure than traditional removable dentures, they also allow us to replace a missing tooth without modifying your neighbouring teeth. The Apple Dental team will be happy to discuss all your alternatives for tooth replacement with you. During your consultation the Apple Dental team will check you have sufficient bone, and enough space in your jaw for your adjacent teeth’s roots to be away from the implant. If you don’t have enough bone, we may recommend growing or grafting bone, either from elsewhere in your mouth or places like your hip. How long will my dental implant treatment take? Depending on where the implant is placed into your jaw, full integration with your bone will take around 4 months for the front lower jaw; around 9 months for the back upper jaw; and around 6 months for sites elsewhere in your mouth. Naturally, if bone needs to be grown or grafting has taken place, your treatment time will increase. The simple answer is that every patient’s results will be different. While studies have shown that implants can have a very long life once integrated with your bone, their longevity may be affected by your overall health, diet, oral hygiene and whether you smoke. Temporarily restoring missing teeth, with a single tooth implant and a partial denture. More questions? Feel free to call us on (02) 9420 5050; or visit us at 1 Finlayson St, Lane Cove NSW 2066!